I know I am a little late with my start to the week, but let’s just say our craft week starts on Thursdays. My friends and I have had a lot of fun with our hand looms, and I thought I would share some of our projects, and perhaps tempt you to buy one. My plan is to spend this week posting about my (limited) experience with small, hand held looms. I first learned about small hand looms from a post on the Craft: magazine blog. Each loom is a wood frame with vertical pins on it (usually metal), and comes with a long tapestry/weaving needle. The simplicity of the set up and the sophistication of the finished squares immediately piqued my interest. It was a matter of moments before I had ordered a 2×2 inch loom for myself (and one for a friend). When I received it I immediately started making squares, and was delighted at the color patterning and textures that were coming out of my short yarn scraps in no time at all. Small hand held looms were born back in the 1930’s, and a popular model was the Weave-it. It was most commonly available available in a 2×2 inch size (junior) and a 4×4 inch size. Production of it in some form continued until the 1970’s and a wealth of pattern books were published in those four decades. The Weave-it was the grandfather to today’s Weavette loom, produced since 1998 by Buxton Brook Looms. Buxton Brook makes a fantastic hardwood lacquered hand loom, and has expanded the available loom sizes to larger looms and rectangular shapes. They are also a source of appropriately sized weaving needles and carrying cases for your looms. The definitive source for weave-it history, patterns, and projects is eLoomanation. This site has a thorough history of all handheld looms (there were more than just the weave-it), and even has some pattern books available for download (saving you a trip to ebay). Now, there is also an eLoomanation blog where you can find some of Jana’s recent great project ideas. My looms. top: 5 inch weave-it rug loom, right: 2 inch weavette, left: 4 inch wooden weave-it. If you are thinking of buying (especially a vintage loom), research at eLoomanation first. For a modern Weavette, you can purchase directly from Buxton Brook Looms or Purl Soho. At the time of writing, however, both are out of the popular 4×4 inch and 2×2 inch sizes, so you might have to turn to ebay if you are impatient. Well, you can only make squares or rectangles. Which you can sew together to make larger squares and rectangles. Hmmm… doesn’t really sound that fun… That’s okay, I have the rest of the week to show you how fun they are! Stay tuned! Click to see all of the entries in my “Week of Weaving”. 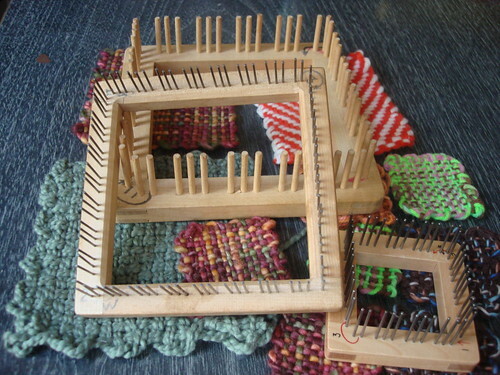 11 Responses to "A week of weaving – Introduction"
Oh, I am glad you\’re doing this! I have a weavette that I\’ve never taken out of the box. I had a loom like that when I was a kid, and all I made were tons and tons of potholders with rag scraps. Ah, memories! 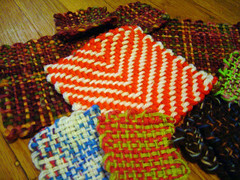 A quick search yielded many vendors who sell potholder looms. Perhaps they would have the harder to find, smaller sizes? Also, Eclectix in El Cerrito had a small loom for sale when I went there a month ago, but as the store\’s name suggests, it\’s not a regular item. I REALLY want a loom, but I want a big, freestanding one. I want one like Sara Lamb has. It\\\’ll stay a dream, for the time being. I’ve wanted one of these looms for months! Thanks for writing this – I’m looking forward to the rest of your series this week. must.have.weavette…..I would kill for some of those cocktail napkins, my BIL would love them for christmas! Impatient, heading to e-bay, NOW! Karrie! Woo Hoo! I’m so happy to see you doing this and am eagerly awaiting the next post. What an interesting post. Although I don\’t think I\’d ever be a weaver, I do like what your making with them. Such a wonderful resource you have provided!! Thank you. I am in the process of searching, bidding and trying to buy a 2 and 4 inch loom. About 36 years ago a lady made my infant daughter a blanket out of squares. I still have it; love and want to now recreate for my 8 grandchildren. Your sight is wonderful and I will revisit time and time again. Any help you can offer will be more than greatly appreciated! hi. can you post a tutorial on how to weave a coin purse?